One of the best things about living in Texas is all the bars and dance halls that have plenty of space for the iconic style of dance known as Country-Western. This style fuses the best of ballroom and swing dancing to create a fun and easy style to be danced to your favorite Country-Western songs. For more information about the Country-Western dances our instructors teach, click on the buttons below. A good place to start if you’re new to Country-Western dancing would be shuffle. 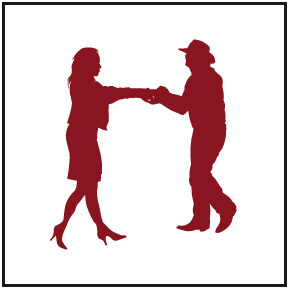 If you’d like to learn Country-Western dancing, we have many different lesson options. Want to learn in a dance studio near you? Try out our Preferred Location Service. Want to learn in the comfort of your own home? We have an In-Home Concierge Service. Prefer a social setting? See if there are Country-Western lessons coming up in our Group Classes.